Family Friendly Ben Lomond, CA Hotel - A Santa Cruz Vacation Destination! Discover the scenic beauty of the Santa Cruz Mountains at our family friendly hotel in Ben Lomond, CA. Offering modern amenities, spacious rooms and a serene location, our hotel is the ideal destination for family vacations and fun weekend getaways. From a refreshing outdoor pool to scenic wooded views, you can relax and unwind just minutes from the top attractions, beaches and outdoor activities in Santa Cruz. 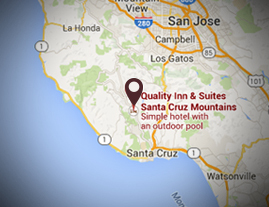 This website is owned and maintained by Quality Inn & Suites Santa Cruz Mountains, a licensed user of certain proprietary trademarks and service marks of Choice Hotels International, Inc.